Pergo Outlast+ Antique Cherry is an elegant mahogany wood design with a rich red tone. This warm wood look is complemented by a smooth texture with dark rustic cross sawn elements that provide interesting contrast and a beautiful satin sheen. The perfectly detailed edge chatter and pillowed bevels give a most luxurious feel to this clean, subtle and authentically time worn look. It's hard to believe that such stunning design can be had on an incredibly durable laminate floor. With SurfaceGuard wear protection and the revolutionary new SpillProtect24 technology exclusively from Pergo that defends against household spills for up to 24 hours, your new floor will be worry-free. Pergo Outlast+. Insanely durable, always beautiful. 16.12 sq. ft. per case. Case quantity: 8. Case weight: 29.58 lb. Buy online Pergo Outlast+ Antique Cherry 10 mm Thick x 6-1/8 in. Wide x 47-1/4 in. 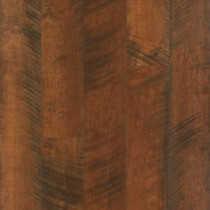 Length Laminate Flooring (16.12 sq. ft. / case) LF000850, leave review and share Your friends.